Sponsored by the Office of Naval Research, the SeaPerch program was developed to inspire and engage young people in a mentor-based program building interest and skills in science and technology. The students in the STEM Club have built SeaPerch underwater robotic devices and last week an intergenerational component was added to the program as the students introduced the devices to the residents of Friendship Village. The students were excited to be able to explain their work to the residents, and the residents in turn, were fascinated with their robots and engaged in the process of operating them. There was a lot to share and learn from both sides. The Office of Naval Research reports that 400,000 engineers will be needed in the near future. However the U.S. has fallen from 3rd to 17th place in the world in terms of the number of college graduates in engineering programs. Addressing a dearth of young people in the U.S. pursuing careers in science, technology, engineering and math (STEM), Tefft Middle School in Streamwood, Illinois, launched an extracurricular STEM Club three years ago. The Club is engaged in the SeaPerch Robotics program. Sponsored by the Office of Naval Research, the SeaPerch program was developed to inspire and engage young people in a mentor-based program building interest and skills in science and technology. The students in the STEM Club have built SeaPerch underwater robotic devices. Last week, an intergenerational component was added to the program as students from the Tefft Middle School STEM Club introduced their devices to the residents of Friendship Village in Schaumburg. 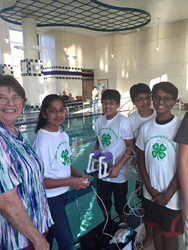 Using the senior living community’s state of the art aquatic facility, approximately three dozen students launched their SeaPerch robotics while explaining their operation to the residents, who took turns maneuvering the devices. In a competitive twist, students and residents teamed up to answer trivia questions while navigating through an obstacle course set up in the pool. This partnership began with Tefft Middle School hoping simply to be able to use Friendship Village’s pool. The event was deemed a great success and will hopefully be repeated moving forward.